I am so sorry that your comments haven't been making it onto the blog for the past two months! There was an unforeseen technical problem. I hope you're not offended. The more comments the better, as far as I'm concerned! And thanks for all of the tips and links you've sent since December--I'm checking them all out now. A couple of updates. The paperback Kiki Strike will be out in May, and there will be some great new stuff on the website around that time, so definitely check it out. Also, the next book should be available later this year! PS: I know the photo doesn't have anything to do with this post, but I thought it was amazing. It's a huge, 450 pound jellyfish. No joke. 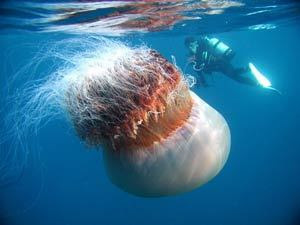 Apparently, tons of these creatures invade the waters around China and Japan from time to time. Yea!!! your back...Again!! Does Oona die in the next book? i was googling you and read the next ones all about her, i'm so glad we won't have to wait til 08 for the next one! !